It happened in an instant. After a breakfast with colleagues, Navajo Nation Police Officer Bernadette Manuelito sees a sedan careen into the parking lot and hears a crack of gunfire. When the dust clears, someone very close to her is lying on the asphalt in a pool of blood. With the victim in the hospital fighting for his life, every person in the squad and the local FBI office is hell-bent on catching the gunman. Bernie too wants in on the investigation, especially when her husband, Sergeant Jim Chee, is put in charge of finding the shooter. Bernie and Chee discover that a cold case involving Chee's former boss and partner, retired lieutenant Joe Leaphorn, may hold the key to the shooting. Digging into the old investigation with fresh eyes and new urgency, husband and wife find themselves inching closer to the truth with every clue . . . and closer to a killer who will do anything to prevent justice from taking its course. 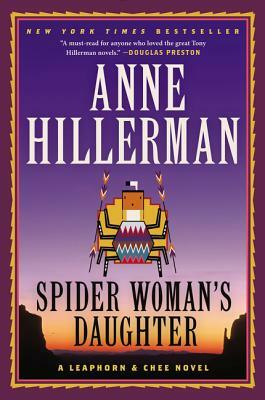 Spider Woman’s Daughter is an intricately plotted, suspenseful, colorful, and unforgettable journey. Readers will fall in love with Bernie Manuelito and look forward to Anne Hillerman’s next effort in what should be a long, enjoyable, successful series. Her depiction of the Navajo Nation is spot on. I loved this book. A daughter takes on her famous father’s legacy in resuming a series focused on Navajo culture…maintaining the integrity…throughout.